Nevada is one of the fastest growing states in the nation in both population and electrical energy consumption. Nevada is also one of the most perfect places on the planet for solar power with over 250 days of sunshine per year. Nevada currently boasts over 886 MW of installed solar power making Nevada number three in the United States for installed solar power. 2014 was a year of huge growth in the Nevada solar industry, when there was over $560 million dollars invested in solar energy. 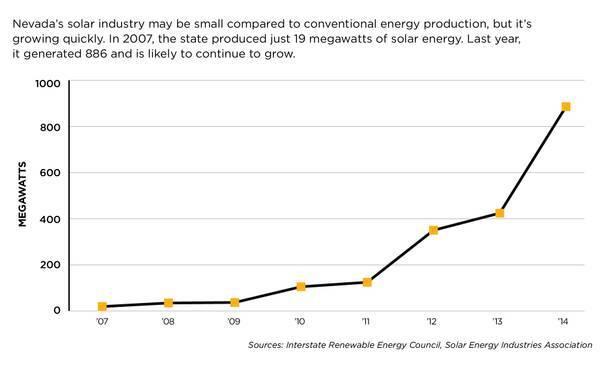 That investment was a whopping increase of over 400% over the amount invested in Nevada solar power in 2013. This growth is expected to continue due to due to an aggressive Renewable Portfolio Standard which requires 20% renewable energy with a minimum of 5% to be solar. This legislation guarantees the growth of solar energy in Nevada for both the commercial and residential sectors. There is currently enough solar energy installed in Nevada to power over 135,000 homes saving energy rate payers thousands of dollars each per year. Solar has also proven to be an economic boon for the State, the growth of solar in Nevada has spawned over 108 solar related companies that employ over 5,900 people, setting a positive example for the rest of the nation. For Nevada homeowners with an appropriate site the financial return on investing in a solar PV system in can be very positive. Whether you choose to lease a system or make an outright purchase Home solar payback periods in Nevada are short and savings will continue long after the system is paid off. The life of a solar PV system is 20 years or more. Because Nevada solar efforts have proven so successful the State has attracted industry leading solar companies with a huge variety of financing options that make it easy to start saving on your energy bills immediately. Contact a Solar Consultant to see what programs, incentives and rebates you qualify for. Often times you can get a home solar system installed on your home with absolutely no upfront costs.